DORCHESTER — Quite simply, “Ragtime” is one of the best and important musicals of the past quarter-century. 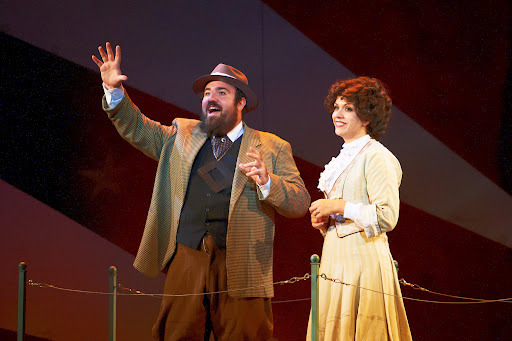 Theatre’s production of “Ragtime” at the Strand Theatre. 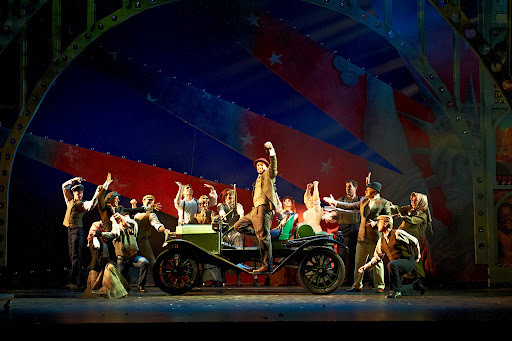 Composer Stephen Flaherty, lyricist Lynn Ahrens and book writer Terrence McNally put their entire hearts and souls into the project based on E.L. Doctorow‘s masterpiece book, and the result was a sweeping, powerful look at an era in the early 20th Century that helped the United States define itself. The lives of three distinct groups — a privileged white family in New Rochelle, N.Y. , a recently-arrived immigrant family struggling to survive, and a group of African-Americans in Harlem — intersect in many ways against the backdrop of cultural icons such at Henry Ford, Harry Houdini, Evelyn Nesbit and J.P Morgan. The issues of that era — economic inequality, immigration, tolerance — remain significant to this day, and perhaps that’s why the American Civil Liberties Union — heretofore never known as a theatrical producer — decided to team up with the Fiddlehead Theatre for the current run of “Ragtime” at the Strand Theatre in Dorchester through Oct. 7. The production also has the support of Boston Mayor Thomas M. Menino; the city owns the Strand Theatre. Unfortunately, Friday night’s opening performance was marred by near-catastrophic sound problems for about the first half of the first act, and intermittently through the rest of the show, due to a blown speaker. The sound was apparently corrected for Saturday night’s performance. Any production of “Ragtime” is going nowhere without a strong actor and voice in the pivotal role of Coalhouse Walker III, who is radicalized by bigotry and the deaf ears after his calls for justice. Damian Norfleet has the requisite power, passion and vocal powers for the role, along with a magnetic stage presence. Right alongside him is Adam Shapiro as Tateh, the penniless Jewish immigrant with a young daughter who comes to this country in search of the American dream. Shapiro, a bear of a man, brings great warmth and humor to his role. Michael S. Dunavant, shines as the idealistic Younger Brother, full of righteous indignation at the indignities heaped on Coalhouse and Sarah, who abandons his privileged life. If you have seen previous productions of “Ragtime,” say with Audra McDonald in her Tony Award-winning performance as Sarah, or Stephanie Umoh , who went from the 2006 production at New Repertory Theatre in Watertown to the 2009 Broadway revival, it sets the bar pretty high for those who come afterwards. Tia DeShazor as Sarah struggled mightily early in Friday night’s show. She seemed distracted by the sound problems — who wouldn’t be — and she was more screaming than singing early on. When the sound improved, she finally relaxed and started singing like she was capable of all along. As Father and Mother, Shonna Cirone and Greg Balla seem a bit younger than most actors and actresses — it shouldn’t matter, that’s why they call it acting — but both seemed to lack the gravitas for their roles. Cirone does well in her second-act showstopper “Back to Before” while some of Balla’s best moments best come with interactions with Alec Shiman, who is excellent as the Young Boy, in the baseball number “What a Game.”. He may be young, but Shiman — who was an excellent Dill in Boston Children’s Theatre’s “To Kill a Mockingbird” — may have a future in this business if he wants it. June Baboian does a nice job reprising the role of the fiery revolutionary Emma Goldman, a role she played in New Rep’s 2006 production. McCaela Donovan can usually be counted on to deliver a strong performance but as Evelyn Nesbit, severe problems with her sound levels in her vocals seemed to throw her off Friday night. Fiddlehead Theatre Director Meg Fofonoff directed this production, and gets huge credit for undertaking the project, complete with a cast of 42 actors, allowing the play to be presented in its full power and glory. With the bugs ironed out, this “Ragtime” — featuring a 16-piece orchestra that realizes the majesty and power of Flaherty’s music — deserves to be seen and appreciated. An aside: If you’re driving to the Strand, the Uphams Corner area is a busy urban neighborhood. There is municipal parking on Ramsey Street. Take a right onto Dudley Street from Columbia Road, then your first right onto Ramsey Street. The Fiddlehead Theatre production of “Ragtime,” through Oct. 7 at the Strand Theatre, 543 Columbia Road, Dorchester. Music by Stephen Flaherty, lyrics by Lynn Ahrens, book by Terrence McNally. Based on the book by E.L. Doctorow. Directed by Meg Fofonoff. http://www.fiddleheadtheatre.com.